There is no one left for Mila to trust. Except for a boy she barely knows. But Hunter has no idea who—and what—Mila really is. She can’t bear to reveal her secret, even though he’s unwittingly joined her search for Richard Grady, a man who may know more details of Mila’s complicated past. Yet the road to the truth is more dangerous than ever. With General Holland and the Vita Obscura scouring the earth for her whereabouts, Mila must rely on her newfound android abilities to protect herself and Hunter from imminent harm. Still, embracing her identity as a machine leads her to question the state of her humanity—as well as Hunter’s real motives. 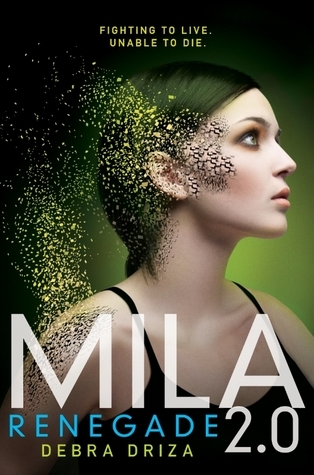 Perfect for fans of I Am Number Four and Divergent, this action-packed and heart-wrenching second installment of MILA 2.0 will leave readers breathlessly awaiting the series conclusion. Action packed is right. This series is some sort of combination of science fiction and spy adventure. It is non stop action, but done in the best way possible. I did have a tough time remembering what happened in the first book. Although I remembered enjoying it, I have no idea what it was about. I do have one negative- I am not a fan of the male main character. She seems very two dimensional two me (even after things were revealed about him). As much as I love Mila... Hunter is meh to me. Their romance would look a lot better to me if I would have liked Hunter's character (or hated him to be honest). The ending to this was brutal. The book so many twists and turns in the second half that I was completely taken aback. Many things are revealed in this book that make it an important sequel instead of a toss away book. The ending was a bit depressing (as was the cliffhanger). I really want to get my hands on the third book to find out what happens with Mila. All in all this was a fantastic sequel to a high action, exciting series. I can't wait to get my hands on the last book- I don't know how she is going to fit the entire conclusion to the series in one book! I do enjoy an action packed book. This one looks good. I have to read the first one still though.